FM Approvals has recently learned that Anber Globe SA’s Model GE5651 automatic fire sprinkler has been counterfeited and distributed in the Asia market. This discovery comes on the heels of an initial discovery that the Globe Fire Sprinkler Corporation’s Model GL5651 and GN5651 automatic fire sprinklers had been found counterfeited in the Asia market. The GE5651 sprinkler had previously been FM Approved in August 1999 until formal FM Approval was withdrawn in June 2003, when production was discontinued. 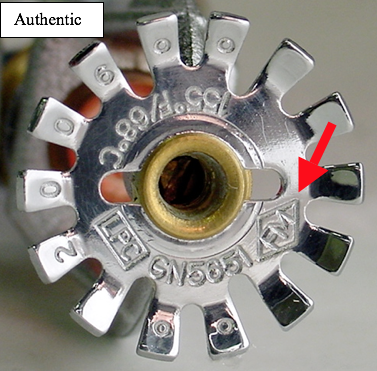 There are several telltale indicators that differentiate the counterfeit from the authentic sprinkler. Figure 1. The photographs on the left depict representative samples of an authentic (left top) and a counterfeit (left bottom) Anber Globe sprinkler’s deflector markings.  The authentic sprinkler’s deflector exhibits the FM Approvals certification mark which incorporates a diamond in the mark, while the counterfeit exhibits a modified/incorrect version within a triangle symbol. Please note that the sprinkler deflector depicted as the authentic photograph indicates a different Anber Globe SIN marking (GN5651) than the shown counterfeit sprinkler GE5651. The GN5651 sprinkler deflector photograph was utilized only to clearly identify the authentic, authorized FM Approvals certification mark. Figure 2. The photographs on the left highlight a close-up view of the thermal activation bulbs of the authentic (left top) and the counterfeit (left bottom) sprinklers. The authentic, FM Approved Anber Globe SA sprinkler was manufactured with a 5 mm Job G5 bulb. 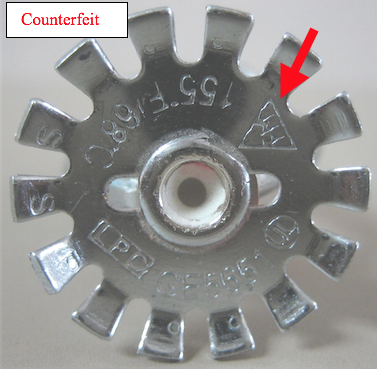 The counterfeit Anber Globe SA sprinkler was manufactured with an unknown bulb manufacturer with the bulb markings of “YD” “5.” The symbol separating the two marking could not be deciphered.